Michigan Republicans announced this week that they do not support higher renewable energy targets and that they will seek to eliminate energy efficiency standards from state law. Separate comprehensive energy packages emerging from the House and Senate — both of which have Republican majorities — differ on some topics, including electric choice, but committee chairs from both chambers are intent on removing efficiency standards that were adopted seven years ago. Neither packages call for a higher renewable portfolio standard, while one House Republican introduced a stand-alone bill Thursday to repeal the RPS. State Rep. Aric Nesbitt and state Sen. Mike Nofs, the Republican chairs of the Legislature’s energy committees, say they don’t support mandates in energy policy and want to pursue a market-driven, “all-of-the-above” portfolio without targets. Both say they support developing renewables and energy efficiency if it’s cost-effective for ratepayers through Integrated Resource Plans, which in other states are a years-long projection by utilities of their resource and capacity needs. Clean-energy advocates are attacking the plans for ending what they say has proven to be an effective policy and a good investment for ratepayers. 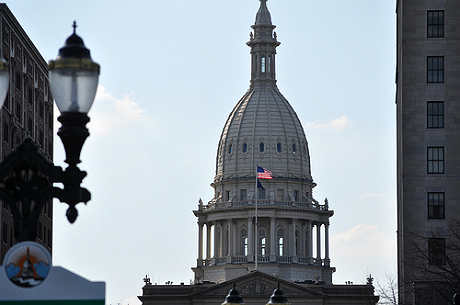 Nesbitt introduced a bill package on Thursday that includes amending PA 295 of 2008, which established Michigan’s 10 percent by 2015 RPS and energy efficiency standards. It would keep that percentage in place, but as Nesbitt pursued last session, his proposal would change the state’s definition of “renewable energy” to include burning municipal solid waste like scrap tires. Nesbitt also is drawing the ire of free-market advocates for proposing to remove electric choice and send Michigan back to a fully regulated state. Nofs has not introduced specific legislation, but details about his plan were given to Midwest Energy News this week. Nofs is proposing a “clean energy standard” that would repeal the 10 percent RPS and credit utilities for lowering pollution emissions through natural gas, nuclear and renewables. Meanwhile, Democrats this week pitched their own plan that doubles the RPS to 20 percent over the next seven years, the same amount of time it took Michigan to reach its 10 percent goal this year under a 2008 renewable energy law. This week marks the first time specific proposals have surfaced to rewrite Michigan’s comprehensive energy policy. They also come in the same month that Gov. Rick Snyder is expected to lay out his own energy plan. Snyder has stated a general interest in expanding natural gas, renewables and energy efficiency in Michigan, but has not yet offered details. Specifically, Nofs’ plan would set emissions standards for power plants on carbon dioxide, nitrogen oxide, sulfur dioxide, lead, mercury, ozone and fine particulate matter using 2015 levels as a baseline. “Zero emissions technologies,” including wind, solar, hydro and nuclear would be given extra credit for additional megawatts produced based on a multiplier. Nofs said his plan does not eliminate incentives for further renewable energy development, which he says will likely happen anyway in order to comply with proposed federal emissions rules. Nofs has led a working group for the past several months that has taken input from a diverse group of stakeholders, from utilities to environmental groups. A five-page draft of his Comprehensive Energy Plan is still a working document, he says, with further considerations — such as whether emissions targets should be fixed or increase over time — and more input from the group is anticipated. Nofs recognizes that energy efficiency and renewable standards codified in PA 295 of 2008 have worked until now and have made the cost of renewables competitive. With an RPS gone, electric providers under Nofs’ plan would still be required to offer a “green pricing” program to customers wishing to buy renewable energy by the kilowatt-hour. In addition to eliminating the RPS, Nofs proposes to do the same for Michigan’s energy optimization program, largely for the same reasons. These moves would also negate the need for surcharges on ratepayer bills, though in most cases those have already been eliminated or greatly reduced due to the success of the programs. Nofs also believes his plan gives electric providers an opportunity to comply with the standard should prices for natural gas remain volatile. “This is a plan for 10 years down the road that will encourage and make it more flexible for energy providers to react to whatever the market may do,” Nofs said. Elsewhere in his plan, Nofs proposes to keep Michigan’s hybrid electric choice law capped for those who want to participate at 10 percent of a utility’s load. While utilities have been fighting to eliminate the cap and go back to a fully regulated market, Nofs’ plan would also give utilities some assurance in anticipating load if choice customers choose to come back to a regulated utility. Current choice customers would have to make a “one-time declaration with the MPSC” saying whether they plan to stay with their alternative energy supplier or go back to a regulated utility, according to the plan. Nofs is also calling for the state to require regulated utilities to file Integrated Resource Plans with the Michigan Public Service Commission every three to five years to track long-term load needs. As for distributed generation and net metering, Nofs’ plan seeks to increase the value of electricity generated to DG customers; increase the 150 kW cap and require dynamic pricing options where possible. The group will continue studying the relationship between fixed charges and usage charges, which has proven controversial in other Midwest states. While Nofs’ plan would maintain the 10 percent cap on electric choice, Nesbitt wants to return to a fully regulated electric market, a position that is supported by Michigan’s major investor-owned utilities. “The main pillars I’m trying to work from are based on reliability, affordability and adaptability,” Nesbitt told reporters on Thursday afternoon. Nesbitt also takes a different approach to PA 295 by amending what could be defined as renewable energy. Under his plan, that would include municipal solid waste like scrap tires and any kind of trees and wood for biomass, not just those “derived from sustainably managed forests or procurement systems,” as is specified in the current law. Like Nofs, Nesbitt wants the state’s and region’s future resource and energy efficiency planning to be done through a utility’s five-year Integrated Resource Plan. He also believes that renewable development will occur as the state complies with EPA regulations. Meanwhile, leading Democrats on the House and Senate energy committees announced a set of “principals” that include doubling the state’s RPS to 20 percent by 2022 and also doubling energy efficiency standards. Sen. Hoon-Yung Hopgood and Rep. Bill LaVoy, both from southeast Michigan, say their plan is good for business, ratepayers and the environment. They point to the $2.9 billion in investment from renewable energy and the return on investment of nearly $4 per $1 spent on efficiency. “It’s a good, strong policy that will let people recognize that Michigan is serious about renewables,” Hopgood said. The RPS goal would also provide “off-ramps” to give flexibility in meeting a new target, he added. This is not yet specific legislation, but rather, “things we’d like to see in the conversation around energy policy this year,” Hopgood said. These principals also include eliminating the need for any new surcharges on customers for renewables and efficiency, developing better transmission connection between Michigan’s two peninsulas and giving residential customers better access as stakeholders in MPSC rate cases. Hopgood said the plan also prioritizes grid reliability, capacity and pipeline safety. At least two conservative groups have already formally opposed Nesbitt’s proposal. Larry Ward, executive director of the Michigan Conservative Energy Forum, said in a prepared statement that the state “can and must be bolder” when it comes to energy efficiency. The Michigan Freedom Fund criticized Nesbitt for seeking to return to a fully regulated market. James Clift, policy director for the Michigan Environmental Council, said Wednesday that he had not yet looked closely at Nofs’ plan, but that his organization hopes any new policy meets five standards: controlling costs, providing minimum risk to ratepayers, encouraging economic development, protecting the environment and preserving reliability. The MEC issued a statement on Thursday criticizing Nesbitt’s proposal for eliminating the energy efficiency program and for classifying burning waste derived from fossil fuels as renewable. As for Nofs’ plan, Irwin said it “doesn’t cement long-term investments in Michigan. Renewable energy is providing jobs and payments to farmers and landowners.